The Membership Billing system is a powerful tool that can automate nearly all of your member billing procedures that you would previously have done manually or not at all, like membership renewals, batch renewals, automated reporting for accounting, etc. New Member Registration - new members can sign up and pay dues online; payment information is automatically recorded in the billing system. Convert Prospects to Members - at any time, when a prospect is ready to join, an admin user can convert their prospect record to a member record, creating a invoice for membership. The new member can then pay dues. Optionally, you can turn on links that are embedded in broadcast emails sent to prospects, such that they can click on the link, and convert themselves to members on their own. All of this is highly configurable. Alternate Easy Registration - in some cases, you may want to offer a non-monetary registration (such as for representatives of businesses that are members, or family members of a family-based membership). We can configure this for you. Association Branding - make the system look like the rest of your website by customizing the colors and adding a header image for your organization. 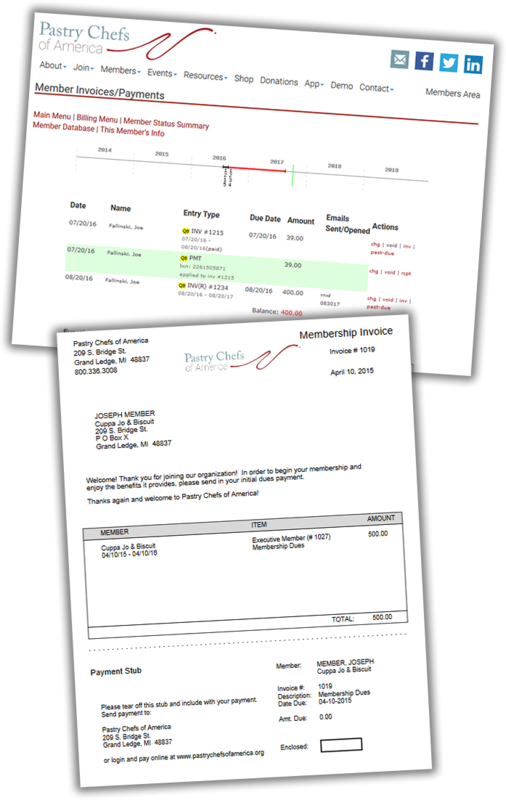 Print/Email Invoices and Statements - offers the ability to send renewal invoices conveniently via email or print them off for members without email addresses (formatted as PDFs). Multiple Membership Plans - allows for differently priced membership, vendor, sponsor, and prospect plans; can incorporate registration fees and special dues structures. Automated Renewal Notifications - offers the ability to automatically send email renewal notifications/invoices. Auto-Drop - system can automatically drop members from the member database in the case of non-payment after a pre-determined number of days. Invoices can also be automatically credited-off in cases of drops. Member can also be automatically moved back to prospect-type if appropriate. Member Billing Status - Optionally, you can turn on a feature where members can log-in and view/print their current and prior dues invoices, as well as receipts for payments made. Online Renewal Dues Collection - members can renew their membership by paying dues online; payments are recorded in the billing system. QuickBooks Interface - features an interface with QuickBooks Online; Desktop for PC, 2015 and later - Intuit dropped support for QuickBooks Desktop 2014 on May 31, 2017); due to the complexity of setting up the initial general ledger accounts, there is an initial setup cost and an extra monthly synchronization fee (included in the Platinum MemberLeap plan). Reports - produce a variety of reports detailing which members are paid and unpaid, member status, aging of invoices, monthly renewals, dues forecasting, custom reports, and more. This includes a variety of reports encompassing member billing, event registration, and online store transactions. Full Audit Trail - review transactions, and changes to transactions. Highly Customizable - renewal terms, due date lead times, and more can be customized to meet your organization's needs.